Juliet Aykroyd was born in India and educated in the UK and Italy. She has a BA degree in English from St. Anne's College, Oxford, and a Diploma in Acting from The Royal Academy of Dramatic Art (RADA). Her acting career includes three seasons with The Royal Shakespeare Company, leading roles in repertory companies, and several London fringe productions. Her most recent stage performances were as Laura in a Day by the Sea (Finborough 2008) and as Lotta Bainbridge in Waiting in the Wings (Pentameters 2010), and her television appearances include Anthea in Whatever Happened to the Likely Lads (1974) and Linda in Open All Hours (1976). She worked for many years as tutor and director of acting and text at RADA, Marymount College London, and the London Academy of Performing Arts. Her handbook for student actors, Performing Shakespeare, is published by Samuel French. Her playwriting career began 1990 when she won Second Prize in the TEXACO/NYT competition for her play Silver Hercules. 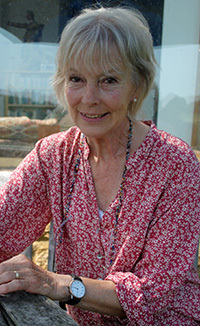 She gained First Prize for Nancy Cunard (Pentameters) in the Oz Whitehead/Irish Pen Competition 2002 and runner-up in the Surrey Writers Competition 2003. Other plays of hers include Accommodation (Cockpit), Vanbrugh's Castles (Greenwich Theatre), The Clean-Up, and The Children's Room (Horseshoe TC). Her plays for young people include The Only One and Hooligan (Arden Theatre 2007). She has also written poetry for many years, and her poems have been placed in several competitions. She won Third Prize in the Strokestown International Poetry Competition 2009, was shortlisted for Torbay and Wells Competitions 2012 and for Strokestown 2013. Her poems have appeared in The Interpreter's House, Poetry Life, Vision and Indigo. Her play Darwin & FitzRoy, published in October 2013, tells the story of Charles Darwin, the world-famous biologist, and his stormy thirty-year professional relationship with Robert FitzRoy, the Captain of the HMS Beagle. But for FitzRoy agreeing to take Darwin, a twenty-three-year-old fledgling naturalist, aboard his five-year voyage of discover for the British Admiralty, Darwin would have become an undistinguished country clergyman in a rural English village. For the first time in 150 years, Ms. Aykroyd has brought to the stage a story that captures the true voices of two of the 19th century's greatest minds and that pinpoints the origin of the creationism vs. evolution debate. Juliet Aykroyd lives in London and in Somerset, UK.